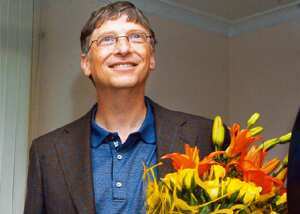 New Delhi: Founder and chairman of Microsoft Corp.Bill Gates is visiting India. Gates, whose visit was described by both Microsoft and his eponymous foundation as personal, paid a surprise visit to Uttam Nagar in west Delhi on Tuesday. Tech start-up Eko India Financial Services Pvt. Ltd is piloting a mobile banking project in this lower middle-class colony. Gates was accompanied by his father and two sisters. “We were actually scheduled to meet the (members of) Gates Foundation today but were very surprised to find Mr Gates here in person. Mr Gates was here on a personal visit to pick up information on our pilot and spent a couple of hours with us," said Abhishek Sinha, Eko’s chief executive officer. On Tuesday, Gates, who stepped down from all executive roles at Microsoft in July, also met Union health minister A. Ramadoss. At the meeting, he was briefed by ministry officials on India’s efforts to eradicate polio, its National Rural Health Mission, as also its HIV/AIDS control and anti-tobacco efforts. The Microsoft chairman then addressed a press conference that was accessible only to television reporters. On Wednesday, Gates is scheduled to address a second press conference, less exclusive this time, on the public health initiatives of the Bill and Melinda Gates Foundation. Later in the day, he will participate in an event at the Indian Institute of Technology, Delhi, to launch a new initiative of Microsoft, of which little detail was immediately available. Microsoft declined comment on the Gates visit saying it was not aware of his agenda. 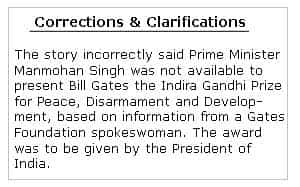 In answer to a query whether Gates was in New Delhi to receive this year’s Indira Gandhi Prize for Peace, Disarmament and Development (announced in March), Penny Richards, a spokeswoman at the Bill and Melinda Gates Foundation, said Gates will not be receiving it on this trip because Prime Minister Manmohan Singh was not available to present it to him. This could not be independently confirmed by Mint.